SRG Sites > NewTechReview > News > Rocket League: Ultimate Edition arrives in Stores August 28 from Psyonix and Warner Bros. Rocket League: Ultimate Edition arrives in Stores August 28 from Psyonix and Warner Bros. 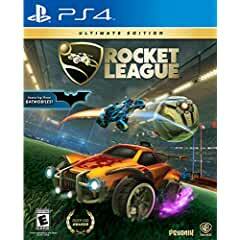 Independent video game developer and publisher, Psyonix, in partnership with Warner Bros. Interactive Entertainment, announced that Rocket League: Ultimate Edition will be available in retail stores in North America beginning August 28 and in retail stores in Europe, Australia, New Zealand and a handful of other territories beginning August 31. Ultimate Edition will feature 16 DLC Battle-Cars plus a collection of cosmetic items and will be released physically on PlayStation 4 and Xbox One for $39.99 USD (or regional equivalent) and Nintendo Switch for $49.99 USD (or regional equivalent). Winner or nominee of more than 150 “Game of the Year” awards, Rocket League is one of the most critically-acclaimed sports games of our generation. Boasting a community of more than 48 million players, Rocket League is a high-powered hybrid of arcade-style soccer and vehicular mayhem with easy-to-understand controls and fluid, physics-driven competition. Available on Nintendo Switch™, PlayStation®4 computer entertainment system, Xbox One, Windows PC, Mac, and SteamOS via Steam, Rocket League includes more than 100 billion possible customization combinations, a fully-featured offline season mode, multiple game types, casual and competitive online matches, and special “Mutators” that let you change the rules entirely.